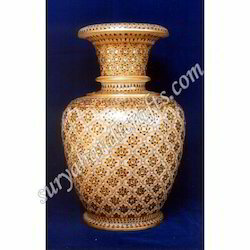 Leading Supplier and Manufacturer from Jaipur, our product range includes Marble Vases - Pot such as Marble Pot, Marble Painting Vases With Stone, Marble Vases With Painting And Stone, Marble Pots With Meena Work, Marble Vases With Meena Painting, Marble Vases With Painting and many more items. Marble Vase with Raja Rani Painting offered are made using quality white marble as a crafting base that provides for highly presentable finish. Further, the detailed raja rani painted in bright vibrant color combinations bring out the ethnic beauty of these vases. The innovative mosaic art provided as a backdrop in different colors also help in bringing out the overall presentation finish of these vases. We can offer these in different sizes and painting themes to choose from with use of quality marble support for smooth finish.